There is a significant amount of construction and demolition (C&D) waste developed due to construction activities and structure demolition, for example, at some installations, construction and demolition waste accounts for up to 80 percent of the solid waste stream. Demolishing and landfilling the building waste incurs significant life-cycle expense to the Owner as landfill space is diminishing. Landfilling debris unnecessarily wastes both natural resources and valuable landfill space. Traditionally, buildings are removed by means of conventional mechanical demolition techniques. Many alternatives are being practiced in the commercial market and have proven to be successful at reducing the amount of demolition debris that ends up in the landfill. Learn about time considerations in demolition and recycling programs. This course is intended for engineers and other design and construction professionals wanting an introduction to the economic, time and opportunity factors that affect demolition and recycling decisions. This course will give engineers and others an introduction to fundamental factors that drive construction waste and demolition disposal decisions. 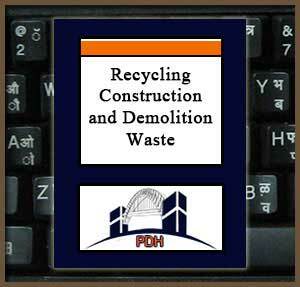 This is an introduction to the factors to consider in making demolition, deconstruction and recycling decisions regarding construction and demolition waste. This course will help you determine if demolition, deconstruction, recycling and/or recovery is feasible and appropriate for your construction or demolition project.